How do you turn your bead work into a piece of Bead Art? I believe the finishing touches and surface embellishments are the secret. 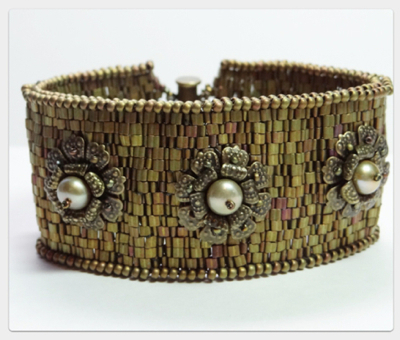 A beaded band using your favorite stitch shows you have mastered the technique. When you dress up the outside rows with a finishing touch it changes the look of the beadwork. Add surface embellishments to complete the design and it turns into art. I picked up the triangle beads at the Bead & Button show from Out on a Whim beads. I love the color. It is called Lizard Skin. As I was checking out I looked at the beads in my tray. I picked up those two tubes and asked "Do I need these"? What kind of question is that? You don't ask. You just buy them! As for a name, I had a hard time choosing. I got so many great suggestions on Facebook. I learned a lot about Tudor Roses and the Bronze Age. The one I like best is "Garden Gate" suggested by Andrew Thorton. That's a stunner, Bev! I'm terrible at naming things. I can't even name a color in an interesting way. It's all pale blue, speckled blue....never something like moon rise over manhattan. Which would be a good name, actually.